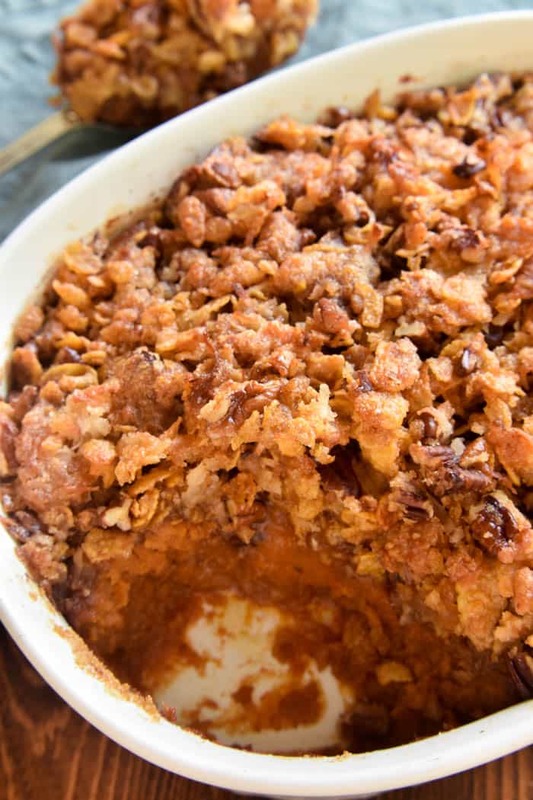 The ULTIMATE Sweet Potato Casserole! Loaded with fresh sweet potatoes, brown sugar, pumpkin pie spice, chopped pecans, and a special secret ingredient, this casserole is crunchy, creamy, sweet, and so delicious. Perfect for all your holiday celebrations and easy to make in advance, so it’s celebration-ready when you are. Whether you’re a long time sweet potato lover or new to the game, you’re going to fall in love with this recipe. 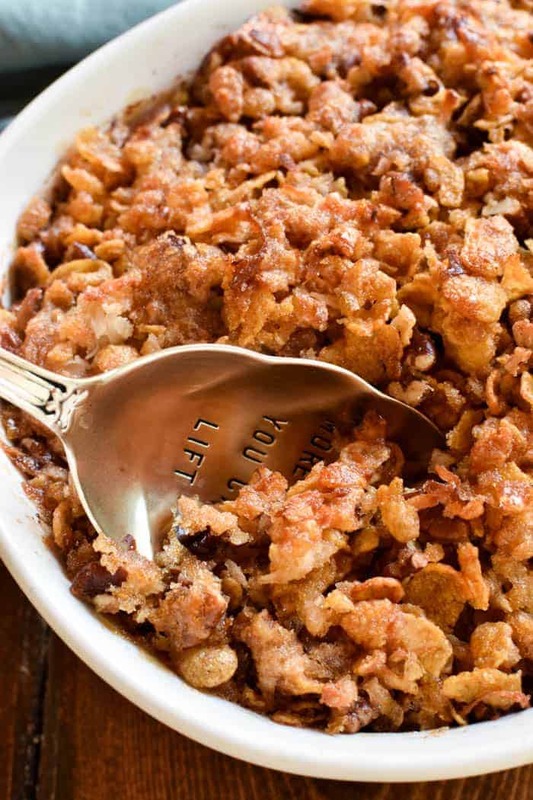 It has the most amazing flavor and the BEST brown sugar pecan topping. Sure to become a new holiday favorite! This may sound strange, but I still remember the first time I ever tried Sweet Potato Casserole. It was at a dinner theater, when I was in high school, with my boyfriend at the time, and I’m pretty sure the play I saw was Fiddler on the Roof. Not that it made a lasting impression or anything. Have you ever been to a dinner theater? It’s only the BEST THING EVER. We have one about an hour from our house and I’ve been there three times. And every time? I’ve loved it. Not just because they put on a great show, around a circular stage, with great ambiance….but because they serve great food. Every. Single. Time. It’s the perfect place to celebrate a birthday, an anniversary, or any special occasion. And the perfect place to try something new. Like sweet potato casserole. I’m not sure how I made it to high school without ever having tried it….but as soon as I did? It was love at first bite. The creamy whipped sweet potatoes? The crunchy brown sugar topping? What’s not to LOVE? It’s the kind of side dish that’s always served with the meal, but actually tastes a little more like dessert. The kind of dish that NEVER has leftovers. And even if you’re stuffed? It’s the kind of dish you’ll definitely still make room for. Mmmm……I can hardly wait for the holidays. 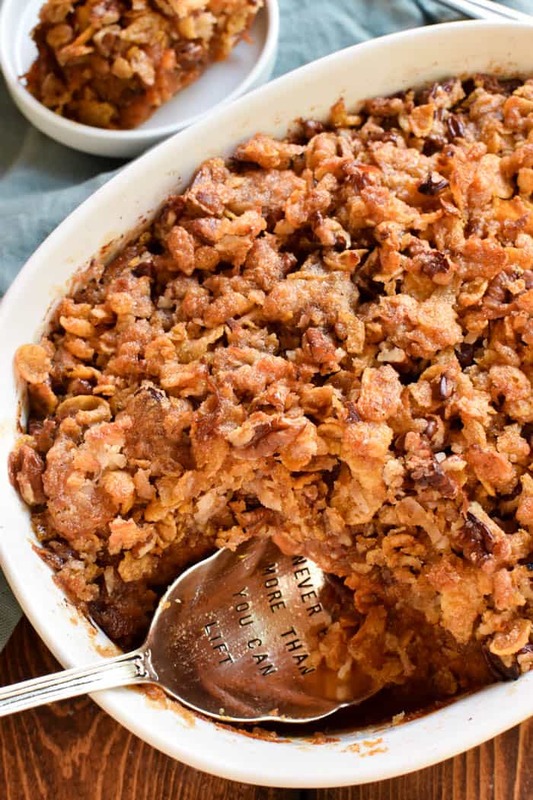 Sweet Potato Casserole with Brown Sugar Pecan Topping makes the ultimate holiday side dish! I know there are a million ways to do sweet potatoes, and we have a few favorites ourselves. Like these Rosemary Roasted Sweet Potatoes or this Sweet Potato Cranberry Pecan Stuffing. And there are a million ways to do sweet potato casserole, itself. Sweet Potato Casserole with Marshmallows is probably the most well known, and as delicious as it is, I have to say I like this brown sugar pecan topping so much more. And you know what? I have the feeling that once you try it, you’ll agree. In fact, I would venture to say that this Sweet Potato Casserole is enough to make a sweet potato lover out of anyone….even the most non-veggie-loving of the bunch. Because when you add brown sugar and butter and pecans….can you really even call it a veggie anymore? Nope. Just a DELICIOUS holiday side dish. And you can never have enough of those. 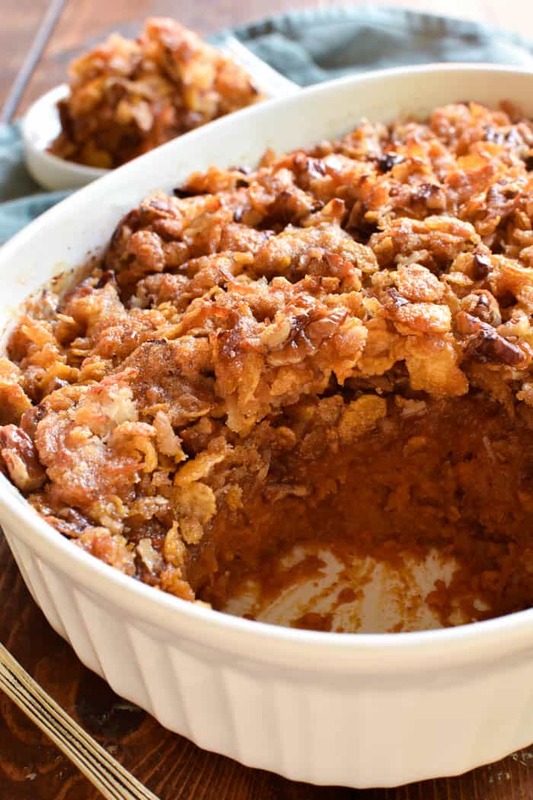 The ULTIMATE Sweet Potato Casserole! Loaded with fresh sweet potatoes, brown sugar, pumpkin pie spice, chopped pecans, and a special secret ingredient, this casserole is crunchy, creamy, sweet, and so delicious. Place chopped sweet potatoes in a large saucepan. Cover with water; bring to a boil. Boil 15 minutes or until tender; drain. Combine cooked sweet potatoes and softened butter in a large mixing bowl; beat until smooth. Add brown sugar, eggs, pumpkin pie spice, and salt and beat until blended. Combine topping ingredients in a small mixing bowl; sprinkle over casserole. Bake 10 minutes longer or until golden brown. Recipe adapted from An Occasion to Gather. That crispy topping looks thoroughly scrumptious! My Thanksgiving table will definitely have this on it! It looks amazing! 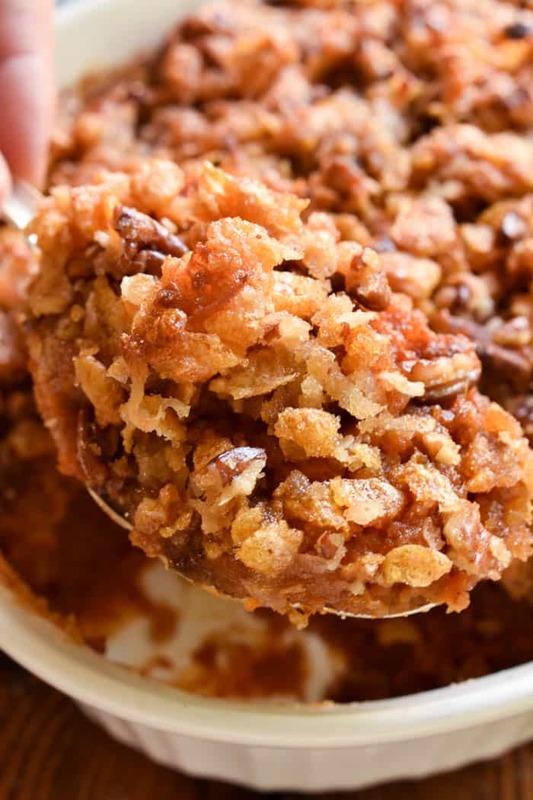 Pecan topping is my favorite on sweet potato casserole! I could eat this dish every day! Sweet potato casserole is a tradition on our Thanksgiving table but I always serve it with some kind of marshmallow topping. The topping on your casserole looks and sounds so good. Bookmarking this recipe to make this year! My whole family will love this! Now that is my kind of dish!